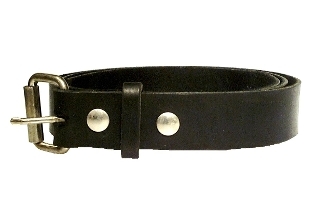 Latigo leather belt for children. These belts are made with the same great Latigo leather that we make our adults belts with. Width Choose an option(2) -- 3/4"(3) -- 1"
Our belts are made from quality leather, tanned for strength, durability. and flexibily. All our belts are hand stripped from a hide of leather. The hides of leather we use are from U.S. steers and tanned in the U.S. Each belt strap is hand inspected and handmade right in the USA. Each belt comes with a Nickel Plate Roller Buckle or Brass Plate and has two snaps that match the buckle. The snaps allows you to change the belt buckle if you desire. You can choose from different width belts. (2) — 3/4", (3) — 1"